Jimmy G's price $4995!!! This 2004 Sienna is limited AWD. There's plenty of room for you and your family in this van. This is a local trade and has a clean CARFAX. Stop in today and fight out how easy and fun we make car buying! Jimmy G's price $18995!!! This 2016 Rav4 is the one for you! Stop in today and fall in love! It's a one-owner, local trade that we sold new. The Rav is an extremely popular SUV. It's not for it's reliability and low cost of ownership! Plus it's backed by Toyota's certified warranty. The best new cars make the best used cars! Jimmy G's price $19995!!! We sold this 2016 Prius new and have serviced it. It is a Package III. It has navigation, push-button start, and XM radio. Stop in and drive it home today! The Prius is one of the most reliable cars on the road. Plus it's backed by Toyota's certified warranty. The best new cars make the best used cars!!! Why is a used Toyota Camry a smart choice for Wilmington drivers? For starters, the Camry is loaded with the latest technology, such as the Entune™ infotainment system, and, depending on the trim level, many will offer navigation, voice activation, even wireless phone charging! The Camry also offers a variety of standard and available safety features, continuing Toyota’s proud legacy of intelligent safety. From body structure and airbags to a rearview camera and innovative driver assistive features, a used Toyota Camry is a safe, forward-thinking option for Washington Court House drivers. When you buy used or Certified Pre-Owned, you’re getting an award-winning car at a great price. Plus, buying from Gusweiler Toyota ensures you’ll get the best experience—we treat you like family and make your car-buying experience second to none. 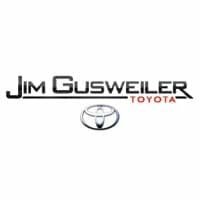 To find the used Toyota Camry you’ve been looking for, visit us at Gusweiler Toyota today!